Work can all too commonly be a pain.. a literal one in the head, neck, shoulder, wrist or back to name just a few. This current ‘epidemic of pains’ could be helped if we only took a few minutes to make adjustments to our seating and computer equipment. Now its time to be devoted to your own health and not just the work in front of you. Bad ergonomics (the science related to efficiency in the workplace) can start to effect the spine and then before you know it starts to take effect other parts of the body. Stiffness, trapping from ‘knots’ in overstressed postural muscles, weakened unused muscles, poor circulation, poor blood sugar regulation and reduced blood oxygenation from less than optimal breathing are just a few of the unwanted side effects that we want to avoid. Check your bag / briefcase each day for items you don’t need. Use a rucksack, especially if you carry a laptop. Make sure both straps are around your shoulders and that it is well fitted so that the bag is held close to your back. Check your chair. You should have an adjustable chair, if not I would suggest speaking to your employer about the possibility of having one. Firstly your upper arm should be parallel to your spine. Place your hands on your work surface and be sure your elbows are at a 90 degree angle. If they are not then raise or lower your chair until they are. Try to slide your fingers under your thigh at the front of your chair. If it feels too tight then you should prop your feet up with an adjustable foot rest. 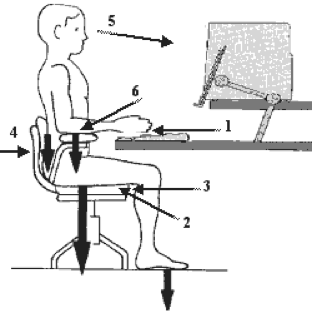 If you are very tall and there is more than a finger width between your thigh and the chair then you need to raise the desk so you can raise the height of the chair. Push your bottom up against the back of your chair then try to pass through a clenched fist between the back of your calf and front of your chair. If you can’t do that easily, then the office chair is too deep. You will need to adjust the backrest forward, insert a low back support (such as a lumbar roll support cushion, a pillow or rolled up towel), or get a new office chair. Your hips should be slightly higher than your knees. If not the lumbar roll or a seat wedge should easily rectify this. Your bottom should be pressed against the back of your chair, and there should be a cushion that causes your lower back to arch slightly so that you don’t slump forward or slouch down in the chair as you tire over time. Never slump or slouch forward in the office chair, as that places extra stress on the structures in the low back, and in particular, on the lumbar discs. Your eyes should be level with the centre of your computer screen. If not either raise or lower it accordingly so as to avoid strain on the spine. Be sure that your weight is evenly distributed on both hips so check the base of your seat is level. If you have anything in your back pocket, remove it so the stress is balanced. Hydrate regularly and preferably with water or water with a splash of cordial. Studies show a well hydrated body helps with improved mood and energy levels as well as helping to prevent against stiffened muscles. Personally, I like the hydratem8 drinking flask and fill a third of the way so that I get up each hour to fill it again. This way I’m hydrating myself and stopping the postural fatigue setting in. Walk around at lunch time, either in the office or preferably get outside for a while. Movement will warm your tissues up and help with circulation. If you already work full time try and avoid unnecessary overtime, it literally could be the straw that breaks the camels back. Your mind, body and soul need some space and time out to get set for a new day. Avoid TV and Internet at the end of each day. More sitting and postural stress is the last thing your body needs after the office and daily commute. 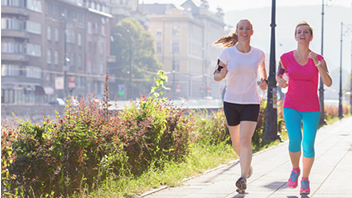 Get some form of exercise outside the office. Whether walking, balanced gym work or other activities such as dancing, some form of exercise can be good to get some condition to the muscles. Losing some of the calories gained by the long sedentary office hours can also help reduce the stress and strain put on our body structure. 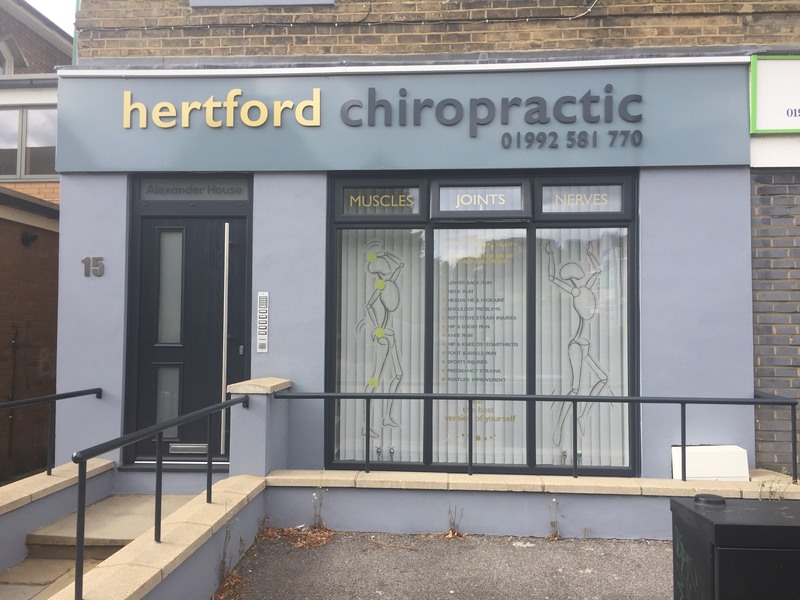 If you are practising the above but are still not feeling your best then consult your chiropractor for further help, advice and corrective treatment and postural conditioning exercises. Sit-stand desks are now becoming more popular so I’ll discuss these in my next blog… be good to yourselves and until then thanks for reading.